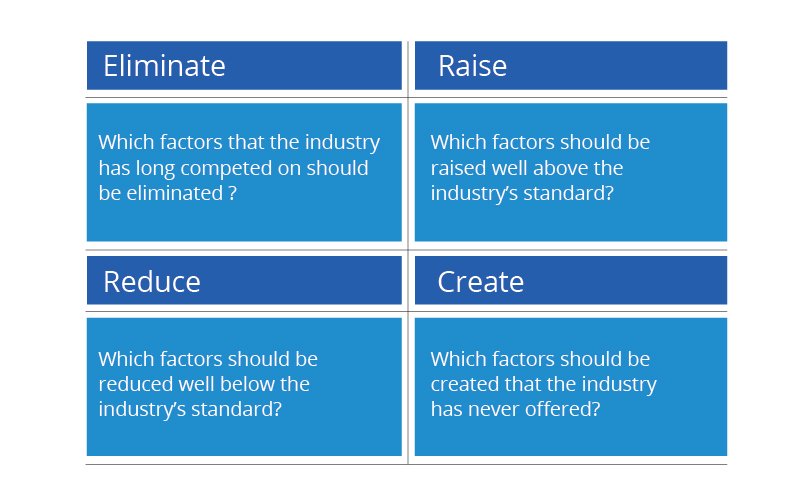 The Eliminate-Reduce-Raise-Create (ERRC) Grid developed by W. Chan Kim and Renée Mauborgne is a simple matrix like tool that drives companies to focus simultaneously on eliminating and reducing, as well as raising and creating while unlocking a new blue ocean. It pushes them to simultaneously pursue differentiation and low cost to break the value-cost trade off. It immediately flags companies that are focused only on raising and creating, thereby lifting the cost structure and often over-engineering products and services – a common plight for many companies. It is easily understood by managers at any level, creating a high degree of engagement in its application. Because completing the grid is a challenging task, it drives companies to thoroughly scrutinize every factor the industry competes on, helping them discover the range of implicit assumptions they unconsciously make in competing.